Autumn is a time for messes. 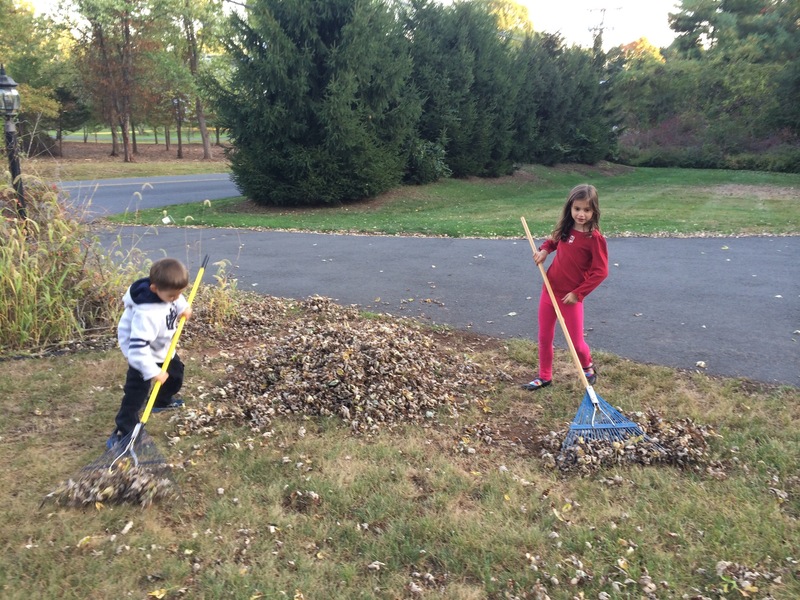 Leaves fall from trees and make messes of lawns. Return to school rearranges schedules and makes messes out of lingering, lazy summer habits. Shifting weather demands widely divergent clothing from one day to the next, making messes of tiny closets forced to fit to two season’s worth of clothes. And, I suppose, these shifts also tend to make messes in my mind. Much as I tend to live in the future – always planning for what comes next – the actual experience of the shift tends to overwhelm me and disturb me with the reminder that I really have very little control over much of anything. Today I experienced one such reminder, and also an antidote, at least of sorts. I spent 90-odd minutes of the afternoon watching a heartbreaking film, with my darling 7-year-old Princess Imagination cuddled beside me. The film was American Winter, and I was watching it because I am a panelist for a screening event tomorrow afternoon and I needed to know its content in order to prepare something intelligent to say about it. The film shares the devastating stories of 8 families who were basically flattened by the Great Recession. They were families experiencing homelessness and hunger, unemployment and foreclosure. They faced moments and months of stress, anxiety, and despair, and while the film also reported some glimmers of hope, there was not a nice, neat happy ending for most of them. These are stories I have heard too many times, and stories that are in one sense my stock in trade – the reasons I go to work each day as well as the way in which I argue and plead for economic justice. But watching them with my sweet daughter at my side was something new. She kept asking questions – questions that made me stop my analytical assessment of how to frame my response and actually engage the pain spilled out across my screen. Her most frequent question was why, and the aching quaver in her voice spoke both of her innocence and of the innocence I’ve lost. I was shaken by her horror that such things actually happen to people. That parents skip meals so that their children can eat. That children feel responsible for making sure their mom packs herself a lunch. That widows and their sons have to sleep on cots in shelters, and that families live for a month with no water and no electricity. I was shaken because these things truly are horrible, and once I get past my defense mechanisms as a professional advocate, I still don’t know how to deal with it. And so, my mind and my heart were a bit of a mess this afternoon, when the kids asked permission to go outside after the film. We took our big bucket of chalk out to our ample driveway to draw pictures and little messages of love. 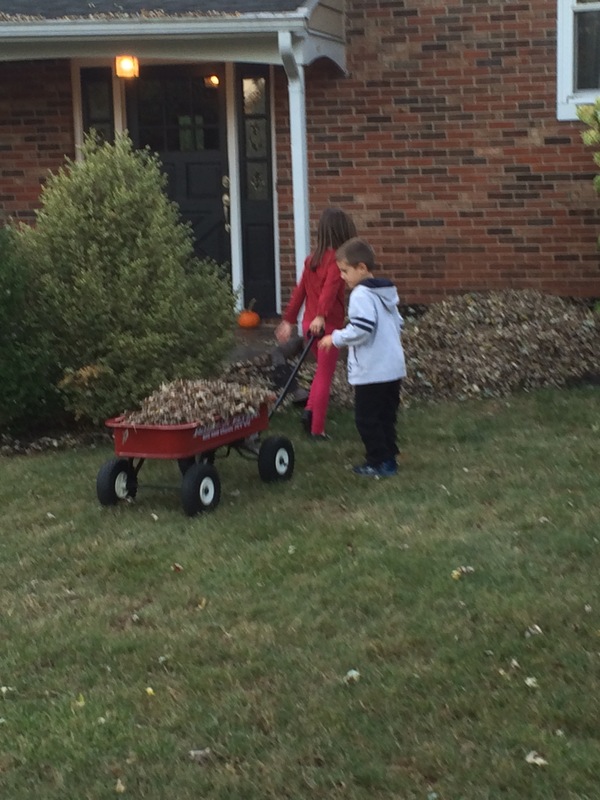 Then the mess of leaves strewn across our yard challenged an attack. So, we took up rakes and sallied forth to do battle. 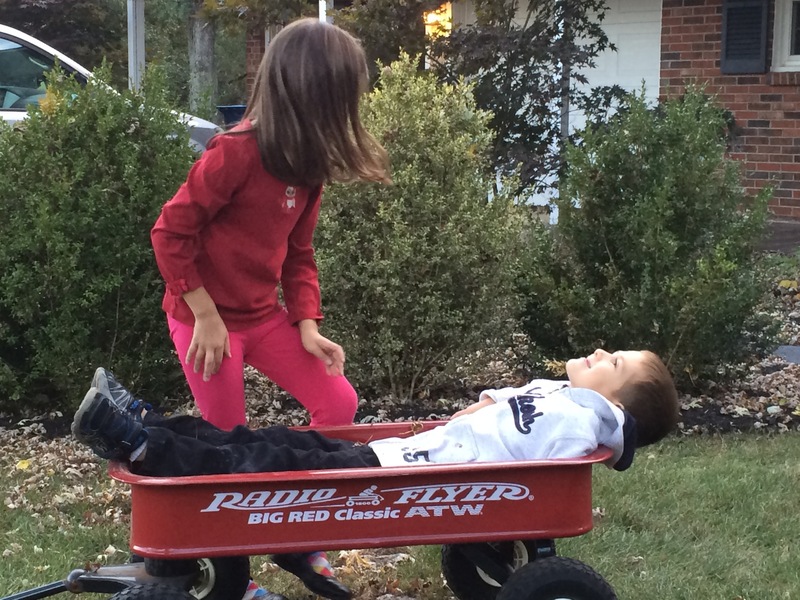 We conquered one small corner, and then conceded some of the hard-fought ground to celebratory pile-jumping and complicated maneuvers involving the red wagon as a transport device ill-equipped to move children and leaves in the same load. It was a simple, silly afternoon and I was poignantly aware of just how fortunate we are to have that chance. AND – I watched the light dance in my daughter’s eyes more delicately than the leaves she was throwing into the air, and that light lifted the cloud from my own heart. The mess isn’t gone. My heart is touched anew with the pain that drew me to this work. I’m chafing at my own inability to bring order to an economic system that is leaving millions behind. 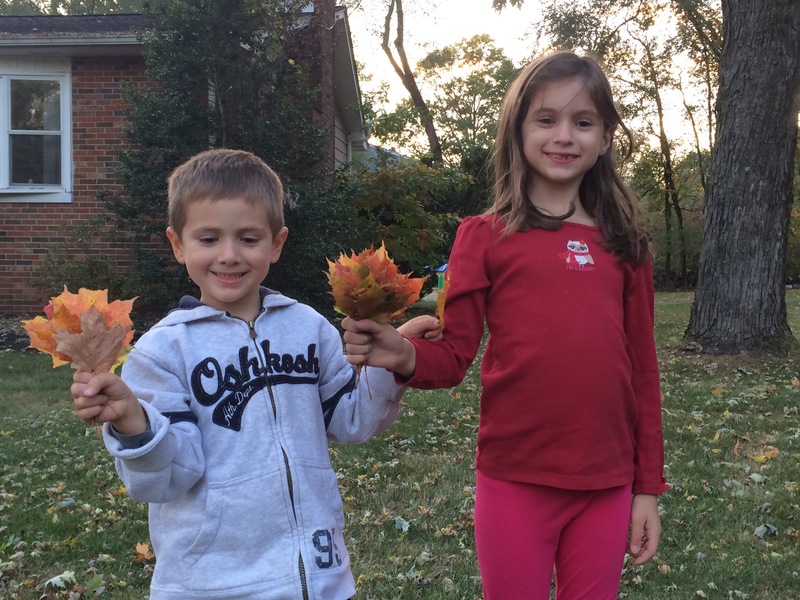 And yet – the falling leaves call for play. And my guilt won’t help the families who have lost their own lawns. And sometimes, the best thing we can do with a mess is let the children play in it – knowing that, at least, I am teaching them to want enough for everyone. This blessing and this weight I feel tonight. Categories: Family, Focaccia | Tags: #MessyBeautiful, Gratitude, Parenting, Poetry, poverty, privilege | Permalink. My son had a bit of a meltdown tonight at bedtime. If you were to ask him this was because he was hungry and mean Mommy wouldn’t let him have more food. I have a slightly different version, which recalls that an hour earlier he was sitting at the dinner table in front of plentiful dishes of food whining that I was making him eat food he didn’t want. Despite his protests, that particular battle of wills was won by the parent brigade and he eventually ate a reasonable helping of dinner, although missing out on dessert due to the time it took to eat and the general drama involved. Needless to say, the bedtime recurrence of drama was not actually about an empty stomach and was actually about petulance that his Daddy and I are taking a harder line on whining and general stubbornness. Still…. when my four-year-old — consummate expert that he is in the art of conjuring big-glistening-tears to roll down soft-quivering-cheeks — peered through thick, wet eyelashes to moan “but I’m so hungry!”… IT GOT TO ME. I defy any mother to hear her child cry about hunger (real or imagined) and remain unmoved. It was genuinely hard for me not to cave. My mind flitted downstairs to the kitchen, where a variety of quick, filling, and reasonably nutritious snacks were there for the taking. I started to mentally flicking through them. What could I offer that he would accept and then could eat quickly so as not to overly delay teeth-brushing? But I stopped myself. 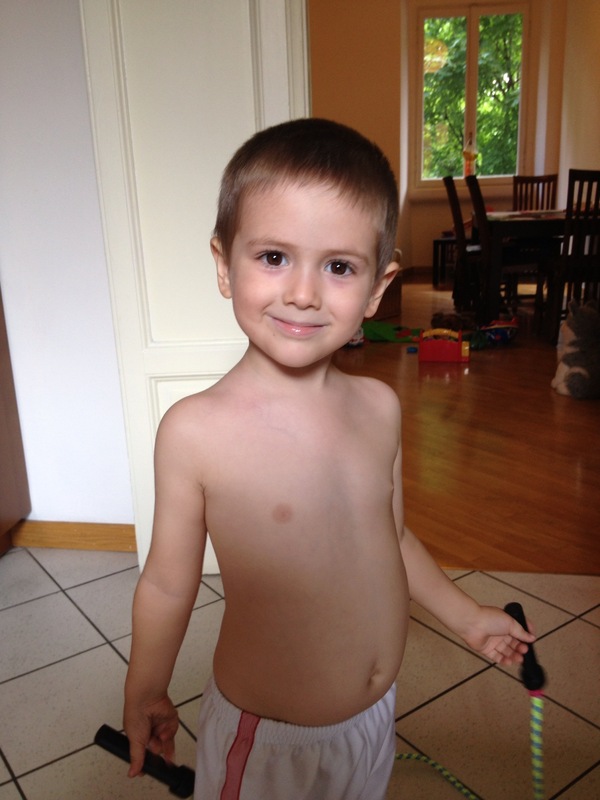 Food was not what my son needed from me – boundaries were. He needs me to teach him important life skills like self-control, and good manners, and operating within a recognized and consistent routine. These skills will allow him to develop into a balanced adult who is able to form positive relationships and see himself as competent to organize his life and to meet his needs in appropriate ways. 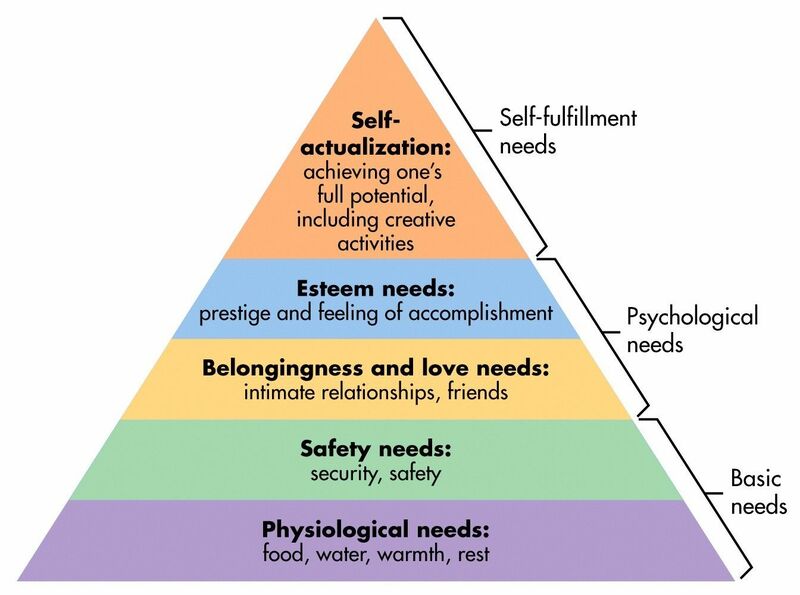 In my social work training the theories of humanistic psychologist Abraham Maslow where a central theoretical framework, particularly his “hierarchy of needs.” This theory identifies five primary levels of human need – physiological, safety, social, esteem, and self-actualization – and posits that these needs must be met in ascending order. In other words, physiological needs (like food, water, and shelter) are the foundation on which others must build. These needs must be met first before the psyche can spare attention for needs that are further up the list. On Maslow’s hierarchy, the needs I am focusing on with my son at the moment are overlapping the third and fourth levels. The relational skills I am trying to teach him are important for his ability to meet his own social needs, and the lessons about his responsibility to control his decisions within a known routine are important to his development of a sense of mastery and self-esteem. In the midst of tonight’s bedtime battle, however, a contrast of needs struck me with staggering force. When his shaking little voice spoke those three little words — “I’m so hungry” — I suddenly understood my own privilege in a way I hadn’t quite experienced before. What would it be like for this conversation to actually be about food? What would it be to see tears rolling down my son’s face, and to know that they were genuine, that his little belly really was grumbling, and to know there was no food in my kitchen to fill it. Even the thought makes my hands start shaking and stings the corner of my eyes with hot tears. I really don’t think I can even imagine what that must be like. But I know far too many women know that feeling all too well. I have met some of them. Some I have seen across the gulf of charity – handing them some money, or a bag of food at the food pantry. Some of them I have met in the course of research – sitting in their living rooms or in local libraries, talking about their struggles so that I could try to give them voice in reports that might gain the ear of a decision-maker. I have seen them as people. I have seen them as mothers. I have seen them as equals. But I have never before understood my own privilege in contrast to their stories in quite the way that I did tonight. I do not imagine that this realization makes any difference whatever for the hundreds of thousands of mothers who are putting their children to bed hungry tonight. If they had the time to read these musings they would probably sound irrelevant… I hope not offensive. But those mothers are doing much more important things than reading my blog. They are using all of their resources, and ingenuity, and over-taxed energy to meet their children’s basic needs, because those have to come first. I don’t offer these musings for them. I offer them for the rest of us, especially those for whom it is so easy to discount the reality of privilege. Privilege is not a political idea or a word on a pyramid-shaped chart that social work students have to learn in their theory class. Privilege is knowing it’s really about something else when your son tells you he is hungry. Categories: Family, Focaccia | Tags: Hunger, Needs, Parenting, privilege, Social Meanings | Permalink. With our return to the States, my little family has been introduced to a classic American ritual: the twice daily wait for the school bus. Not only for Princess Imagination, but also for me, this is an entirely new experience. Having had a relatively unique elementary education in the comfort of my own home, my limited experience with school buses had been transportation for summer camp day trips. These memories are fuzzy: mostly involving the slightly sweet smell of childhood sweat, the uncomfortable sensation of legs in short cotton shorts sticking to vinyl seats, and the awkward anxiety of hoping to find a seat buddy who would be friendly to the shy, gangly girl who didn’t really know anyone. Thankfully, Princess Imagination is forming much different associations with the school bus. The news that she would finally get to take the bus to and from school (rather than suffering – apparently – under the chauffeuring of Mommy) was one of the greatest benefits of moving back to the States and a new school. In her mysterious world, the chance to take the school bus is unaccountably afforded a rank of high esteem. She had repeatedly begged for this privileged transportation to her expat school in Italy, but that service came with a heavy price tag and I liked the chance for regular contact with the place and people who filled her day, so her pleas were emphatically refused. When we finally arrived in the US only to be marooned temporarily in out-of-district transitional housing, she visibly chaffed at the delay. It was unclear whether the chance to take possession of her fondly remembered “flower room” and be reunited with all her toys from the overseas shipment, or the chance to finally start taking the bus, was the more desired objective. Now that this elusive goal has finally been grasped, she is glorying in the possession of it. No longing for a bus buddy for Princess Imagination. Despite my perpetual fears that my shy, introverted daughter will be haunted by my own childhood traumas, she has had no trouble making friends for the circuitous ride through the neighborhood. I hear more about these girls than most of the children in her class; each day her backpack is crammed with little notes and art projects they have made together on the ride; and today, when one of these girls was absent, she came home with a present from an entirely new friend whom she had never met before today but who was apparently captivated enough by my sparkling daughter to give her a color-change pencil. Clearly, the bus is living up to all of her glorious imaginings. My feelings for the bus, however, are not so sanguine. I am no longer fearing that she will endure the painful social awkwardness I faced. 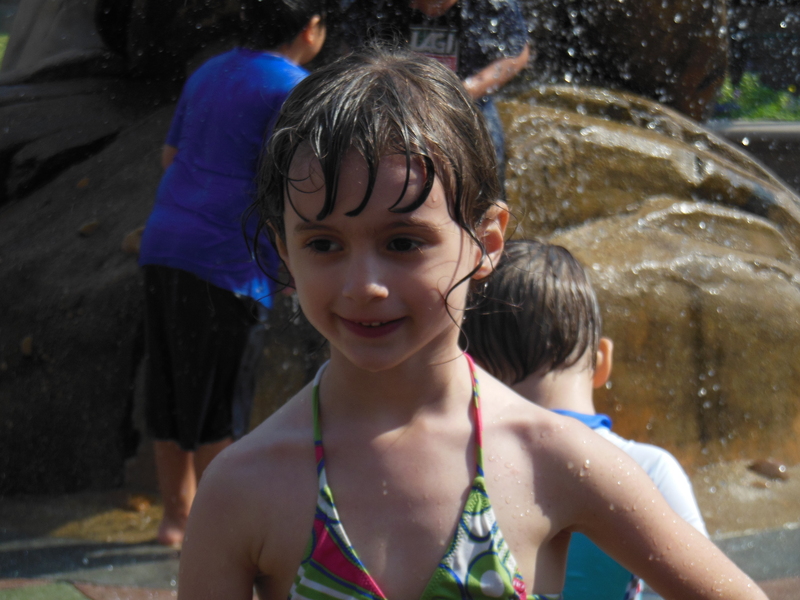 I am not suppressing panicky anxiety at the thought of my sweet baby stepping out of my protective sphere of influence (Little Miss Independent’s confident attitude – and the strong safety record of the school buses – make any such fears feel absurd). I am not even missing the sense of connection to the world where she spends her days (thanks to a teacher who is highly accessible via e-mail and several chances to get involved in class parties and PTA activities in the first few months). No – none of these typical and understandable associations with bus transportation are polluting my pleasure at the arrangement’s convenience and the satisfaction my daughter finds in them. Instead, I am struggling with a banal but nevertheless alarming frustration. I hate waiting for the bus. It’s boring. It’s this weird, brief interlude in my day that gets under my skin and itches just enough to make me realize how pampered and self-centered my life can become in the blink of an eye. So this poem is both my confession, and my appeal to all the other moms out there who struggle to find meaning in the moments of daily drudgery. for the signal of my relief: the slow, quiet flash of yellow lights. the small ice crystals dance across the white expanse of winter lawn. that can fill any empty space in my soul with the command to attend to outside demands. as our warm, dry home embraces me and my daughter together. if her words lull, I can be ready with questions that will speak of my eagerness to know. with thankfulness that changes simple moments into shining drops of time. 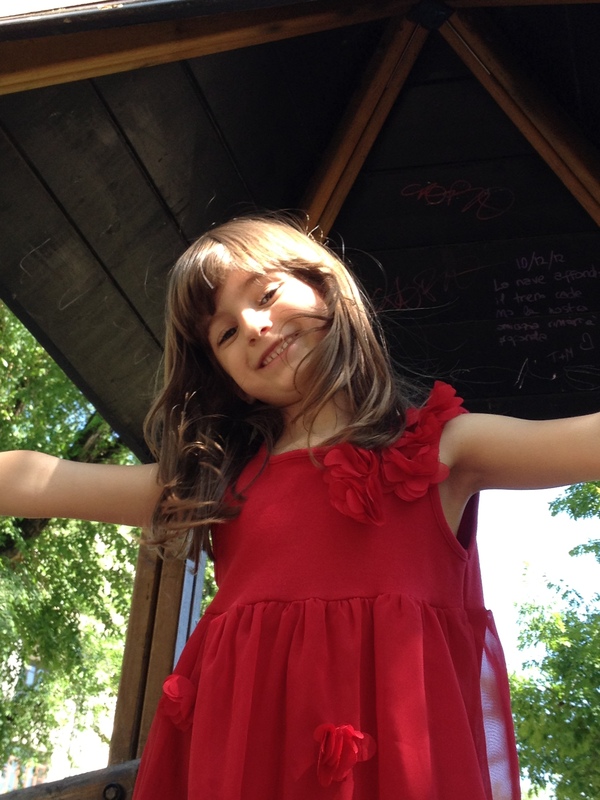 Categories: Family | Tags: Gratitude, guilt, mothering, Poetry, Princess Imagination, privilege | Permalink. This post hails from the beautiful sun-drenched, ocean-breeze kissed, ever-friendly land of California. The kids and I are temporarily “home,” and aside from a nasty head cold and the absence of the patriarch of our little family (thank you for staying in Milan to work, Tyler, so that we can have this wonderful life! We miss you! ), life is good! 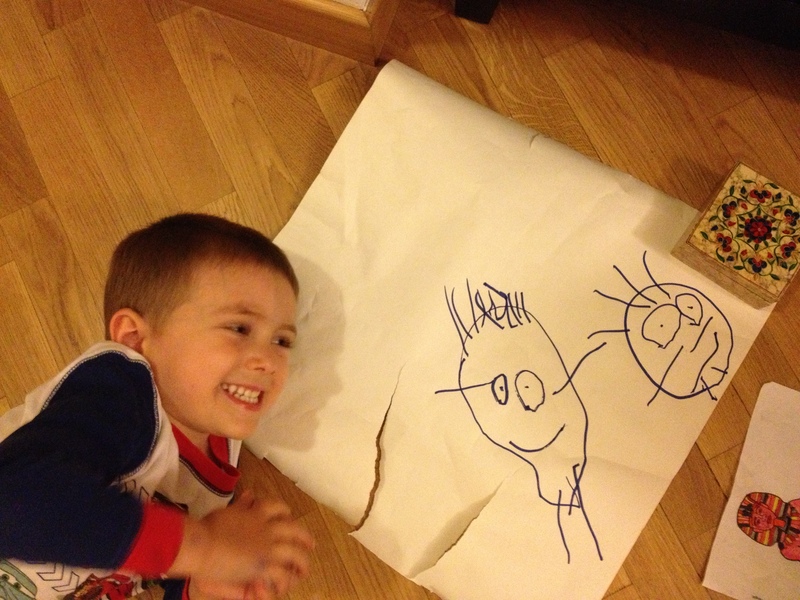 One particular manifestation of that goodness occurred yesterday, thanks to the creative thinking of Papa. He suggested a surprise trip for the kids to one of the local outdoor malls. 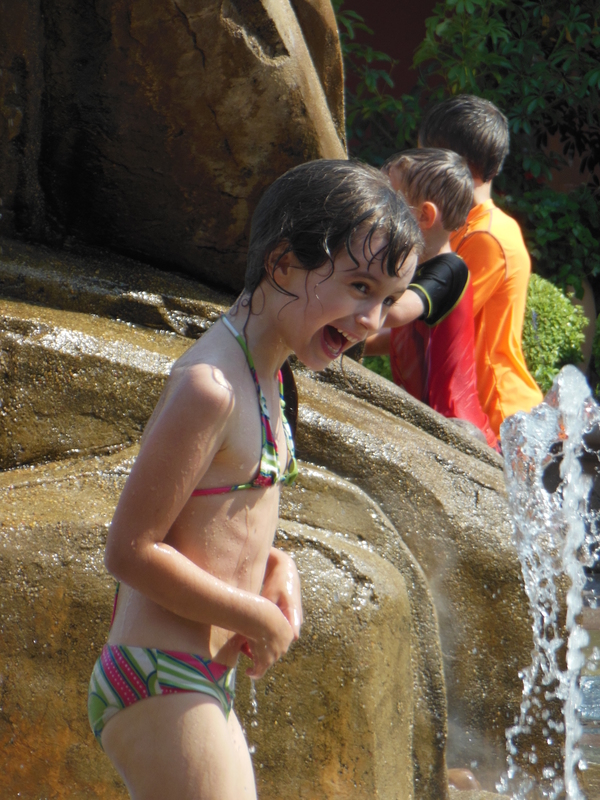 Not to buy anything (other than ice cream), but rather to play in the amazing walk-in water feature that was apparently designed expressly for the purpose of delighting children on hot days. The “water feature,” for lack of a better term, consists of one central fountain/statue with a waterfall flowing down the back, surrounded by 30 or 35 grill-covered water-spouts that shoot up sprays of alternating heights for the pleasure/soaking of the children running over them. My first thought as we approached this phenomenon of child-entertainment, contemporaneous with the delighted squeals of my children, was that this must be the greatest idea ever! The evidence of at least 40 children (ranging in age from approximately 18 months to 12 years) giggling and shrieking with delight quickly confirmed this initial assessment. 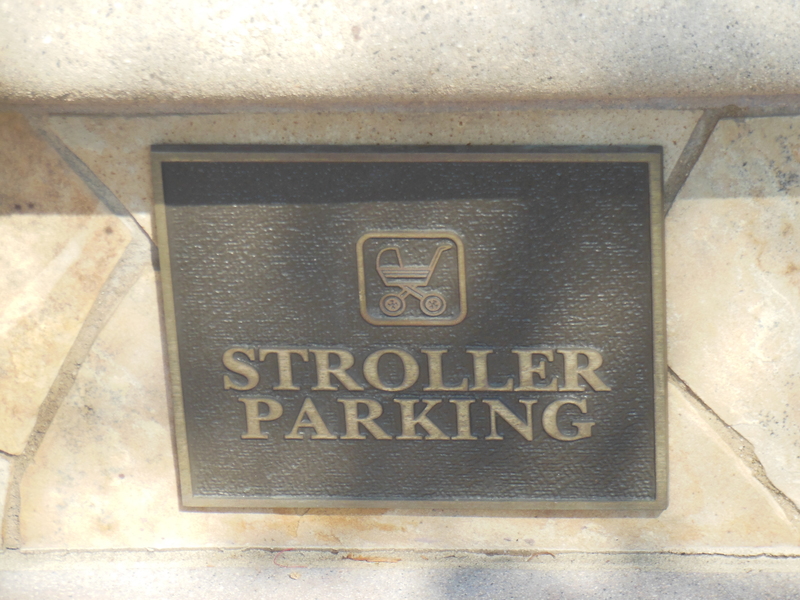 When I noticed the designated “stroller parking” in a specially designed niche, the experience was complete. I was really home! 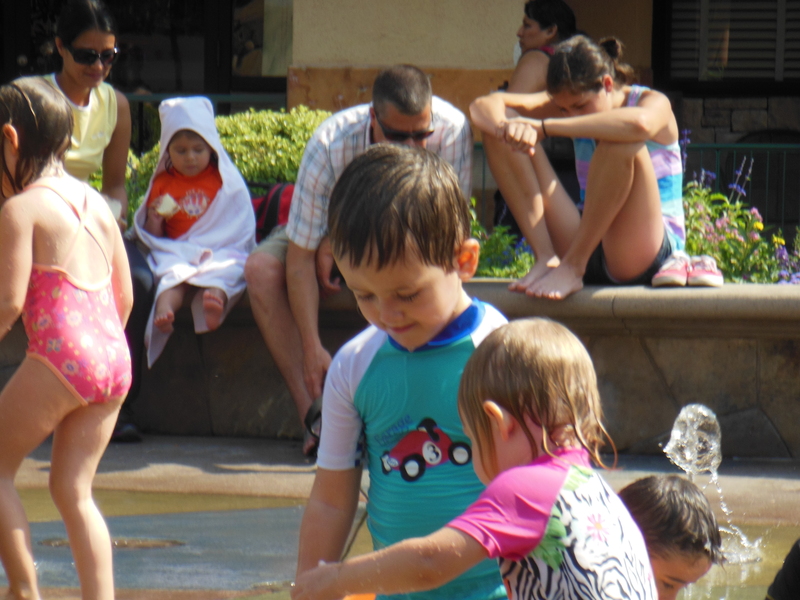 I was back in a land where families are expected to do things together, and where, as a consequence, public space designers don’t devote their attention exclusively to one age group or the other. Not only can I look forward to nearly 4 weeks in which every restaurant I go to will have a children’s menu, and almost all public restrooms will have baby changing facilities (we don’t need them any more, but I still consider this a sign of advanced civilization), but even the shopping malls have made a supreme effort to balance the needs of children and parents. Looking around I completely understood the indulgent, relaxed smiles of the accompanying parents and grandparents lounging on the abundant supply of chairs surrounding the play area. This was a good experience for them, not just their children. They could sit in the shade watching the little ones’ delight in a context that didn’t require a separate trip and an expenditure of entertainment cash. They could divide their time – one adult staying to supervise while another stopped into a shop to make a purchase. I imagine at least one of the solo parents in evidence had probably negotiated whine-free shopping time with the kiddos: “If you can give Mommy 15 minutes to try on shoes, we’ll play in the water fountain before we go home.” Although there was no evidence of it that day, the parents could even join in if they so wished. In fact, when we go back, I think I just might! For my American readers, this soliloquy might seem a trifle exaggerated, so perhaps I should explain. Two days before departing on this visit I received a survey from an English-speaking mom’s group in Milan. The survey was trying to collect information on baby/toddler/child-friendly resources in the area. The survey listed nine categories for which they were collecting information, and I struggled to produce answers for even four. For example: “restaurants offering healthy children’s menus” — well, since the only restaurant I have ever encountered in Italy that offers any children’s menu is McDonalds, and I don’t think Happy Meals qualify as healthy… sorry. “Restaurants that are otherwise child-friendly — including high chairs, play cots, diaper-changing facilities, etc.” — we have sort of re-adjusted our definition of child-friendly since moving to Milan. That now means restaurants that understand to bring out the children’s plate of pasta in bianco (plain pasta, no sauce) as soon as it is ready and that don’t give you dirty looks about the excess noise and mess that accompanies young children. “Facilities that provide private space for breastfeeding mothers” — I used to get strange looks for covering myself with a nursing wrap while breastfeeding in public because most mothers just whip it out … there is no perceived need for a private space. I have accepted the differences about how things are done in my new home, but I am still aware that my American assumption that we will do most things together as a family (rather than leaving the children with a sitter or the grandparents when I go out) means that the world we go out to will not be precisely designed to meet our needs. I can live with it, but it is oh, so nice to experience the alternative. So, in keeping with the patriotic theme of this particular week in the year, I LOVE AMERICA! The gush of appreciation that welled up in my soul as I settled into my chair, however, was followed immediately by a surge of anxiety. 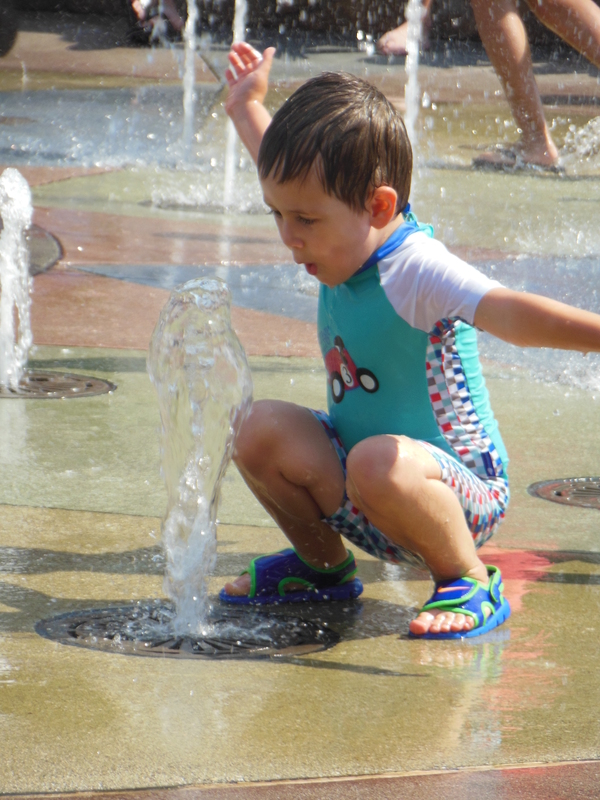 If my quick guesstimate was right, there were significantly more children running around the water fountain than there were spouting water jets. This was a recipe for conflict. I braced for the inevitable collision when two tikes made for the same spurt of aquatic fun, or the cry of complaint that “the girl in the pink isn’t sharing!” In their natural state, children have this tendency to be selfish hedonists. We, as parents, try to moderate this intrinsic quality, but that effort takes years of consistent struggle. I was certain that we would have a problem within five minutes of entering the fun zone. But the minutes passed and I heard nothing but laughter and exclamations of excitement from my children. Five minutes, ten minutes, 15 minutes, and no disputes. My anxiety slowly ebbed into incredulous amazement. There was no fighting. It wasn’t just my two little devilish angels. NONE of the children were fighting! They were just running and jumping and waving their arms wildly through the spray, and miraculously NOT hitting each other! 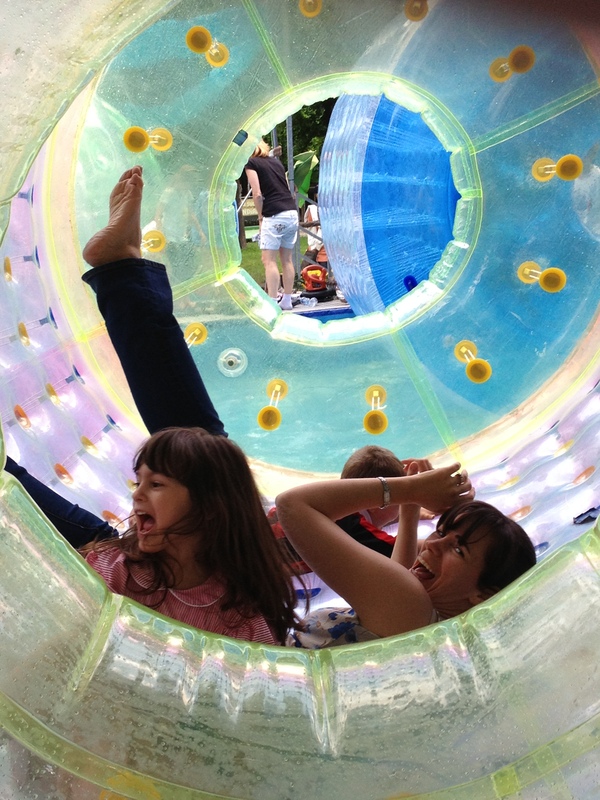 In fact, in nearly an hour of water play I observed only a single glancing collision and one mild confrontation. The Gigglemonster had gone to investigate the reason that three children were standing crouched over a temporarily dormant geyser, and “the boy in the Lightening McQueen pants” had apparently told him to mind his own business. He shared this indignity with me, and then went back to playing. That was it! If by nothing else I was flabbergasted by the apparent spatial awareness being displayed by my two little ones. I have been toiling literally for years to try to adequately explain the concept of not pushing past people when you are in a confined space (i.e. – when exiting an elevator, walking on the stairs, going through a door, etc.). We have talked about courtesy & kindness; we have evaluated the unnecessary nature of injuries that sometimes result; we have applied the Golden Rule and Jesus’ teaching on “the last shall be first” (that’s the only thing that has made any discernible impact so far, and it’s usually followed by a proclamation that “I’m really first, because the last shall be first.”). Despite all my parenting efforts, they still seem oblivious to the space being occupied by other people’s bodies when they have a destination in sight. And yet, in that chaotic context where their entire attention seems riveted on the water spurting from the ground, I saw my children flawlessly veering from their set trajectory to avoid a collision, and even pausing in their headlong race to allow another child to cross their path. This was nothing short of miraculous! Then, disaster! The water spurts stopped. 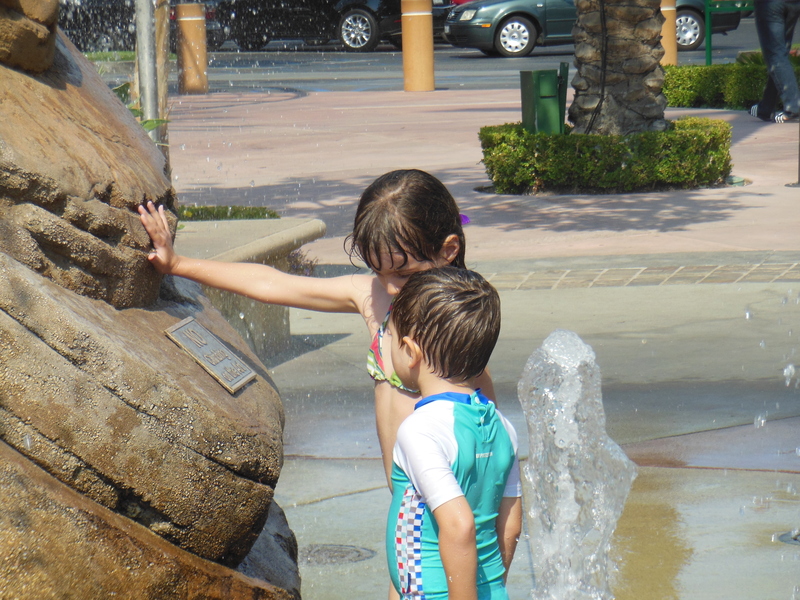 For some reason (likely water conservation, given the drought) the sprays shooting up from the ground took a break, leaving the horde of water-mad children with only the single waterfall flowing down the back of the statue. As the elimination of their amusement dawned in their disappointed faces I anticipated the mad rush of squirming, slippery little bodies endeavoring to claim their spot under the one remaining flow. I perched on the edge of my seat, ready to jump up and rush to the rescue if the scrum produced casualties. But, my vigilance was unnecessary. A good number of children abandoned the game now that the geysers had disappeared, but around 25 remained, gathered in the general vicinity of the waterfall, and then… took turns! Again, perhaps my expectations have been a bit jaded by my last two+ years in the land of the anti-queue. I have become accustomed to the expectation that a new register opening at the grocery store immediately draws shoppers in inverse relationship to how long they have been waiting – since those at the end of the line can most quickly and easily shove their carts into the new line. I have learned that the only way to prevent new arrivals from jumping ahead of me in the line to enter the subway car with my stroller (and then plant themselves squarely in my way as I try to maneuver through the narrow opening) is to ram that wheeled conveyance into their shins or run it over their toes. I have drawn too many blank stares when I have attempted to politely suggest that people respect the line of people waiting to weigh their produce rather than just shouldering their way to the front. Italy has cost me my faith in the sacredness of the line. But, even in America, to see such polite and considerate group behavior from a mass of frolicking children?! That really seemed amazing. And so, as I watched my suddenly considerate offspring waiting patiently for their dousing, and then quickly moving out to provide space for the next child, I pondered the motivation for this consideration. I found it in their smiles. JOY! I was watching a group of children bursting and bubbling with joy. And this joy melted away the petulant selfishness that too often mars the faces of those from one to 92. The fun was too marvelous to be spoiled by bickering and shoving for position. Much better to watch the enjoyment of their peers and build their own anticipation of how fun it would be to dunk themselves under the spray. What is more, the children weren’t looking out for number one and the rest be damned, because the rest were part of their joy. The water sprays would have been fun if Princess Imagination and the Gigglemonster were the only children present, but they were much more fun with everyone else. The joy was contagious, it was exponential. Each squeal of delight from one child drew an echo from two or three others. They were reveling in the group experience and in that joy they found unity. That realization was sweet with just a tinge of sadness. Clearly, our world is in great need of more unity. From the wars that ravage too many countries to list, to the economic exploitation and crisis that mar nearly every life on the planet, to the renewed anger and name-calling that have been stoked by last week’s historic Supreme Court decisions, we are a broken and divided species. I try to protect my little ones from that truth to a large degree, but the truth is that some of their playmates from yesterday will eventually land on the other side of some issue or resource that they hold dear, and then where will be the joy? And so, I have written this story as a reminder to myself, and to them, of what they are capable of. I hope I will remember to pull this out when life is no longer so simple for them and they are struggle to know how to love their enemies. The child with whom they have to share the water is not really an enemy, and yet in knowing how to share their joy with this playmate, they are demonstrating their understanding of the ultimate unity of humanity. We are all better off, we share more joy, when we see the needs of others as well as our own, and work together to meet all needs. True joy is not maximizing one’s own joy. True joy is sharing it. “It says ‘No Climbing’!” Princess Imagination is so proud that she can read! Categories: Faith, Family, Focaccia | Tags: #WPLongform, children, collaboration, Encountering culture, Gratitude, Italian, Joy, Learning, mothering, motivation, Parenting, patriotism, play, privilege, summer, unselfishness, water | Permalink.